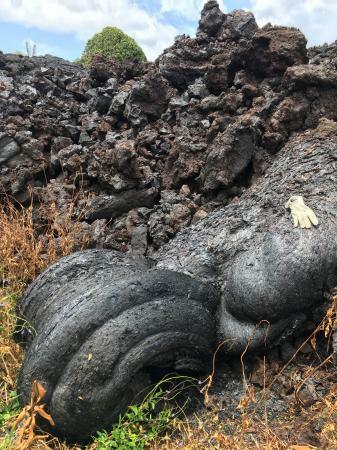 Solidified lava from Fissure 17, photo taken May 22, 2018 along Kilauea's East Rift Zone. Kumu Hula Kekuhi Kealiikanakaole's award winning compact disc release, Kekuhi, came out in 1998 on the Mountain Apple label. Kumu Hula Kekuhi Kealiʻikanakaʻole discusses Pele as a magnetic force originating deep inside the earth. 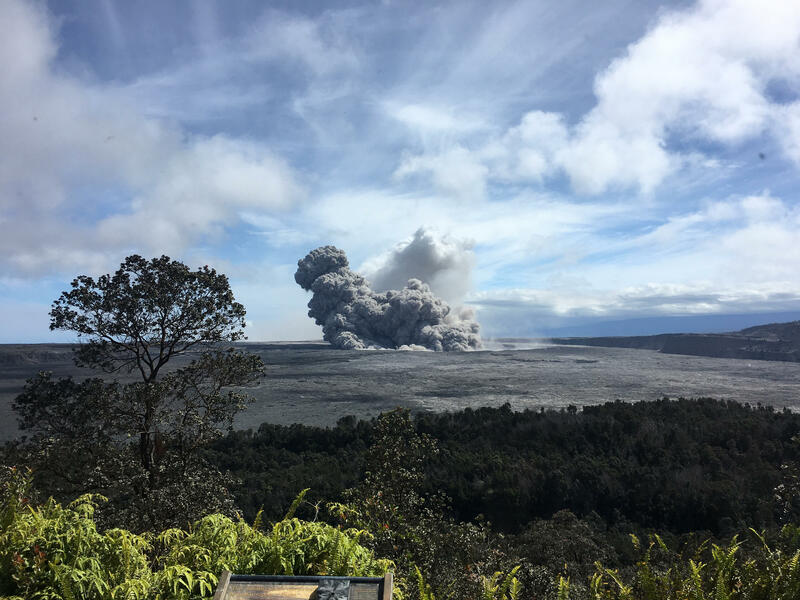 Kumu Hula Kekuhi Kealiʻikanakaʻole talks about her aunt's premonition of the current eruptive phase, its unseen forces, and the role of Pele's mythological sister, Hi'iaka. Highly recommended. The USGS 24/7 webcams are a lot of fun, find them here. Kudos to the USGS map team, they're clear and updated frequently here. Cultural expert, kumu hula Kekuhi Kealiʻikanakaʻole can trace her relationship with Hawai’i island back at least eight generations. 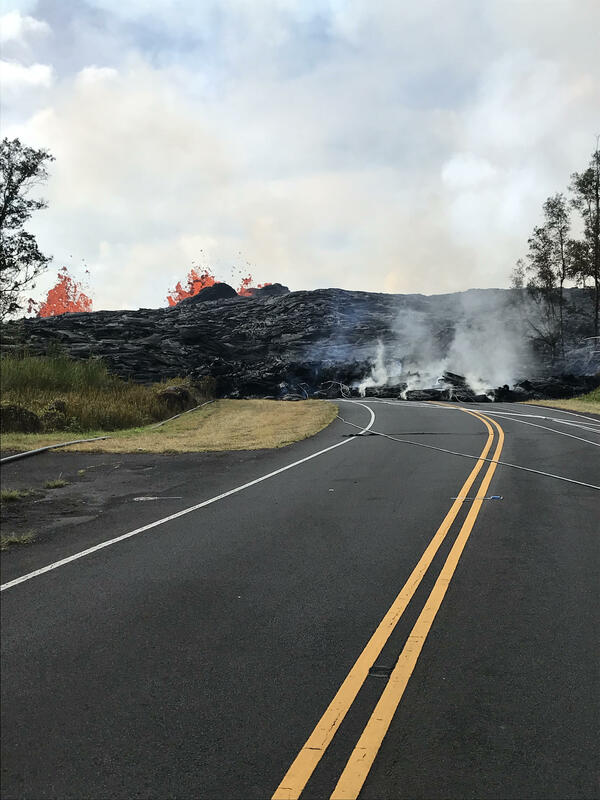 Kealiʻikanakaʻole: For thirty years, we forget, then all of a sudden when the lava starts to erupt, it’s like brand new for us! Then we become fearful of it because at a social level, I think we’re used to somebody else fixing it. And we’re used to somebody else telling us how to have a relationship with the element. Rising ash plume from Halema'uma'u at the summit of Kilauea, May 24, 2018, as seen from the caldera rim near the Volcano House. For cultural practitioners like Kealiʻikanakaʻole, the hula we see on a stage is not just dancing around. Kealiʻikanakaʻole: For us, we don’t forget what’s under us is still moving, because we dance about it daily. We chant it daily. I expect her to do what she is doing today. With her family, with her halau, Kealiʻikanakaʻole has been to Halemaʻumaʻu countless times. Kealiʻikanakaʻole: When you’re there in the crater in the morning, all these processes are going on. The steam is lively, and the sulfur is lively and there’s a certain wind at the crater that sort of rolls from one side of the crater to the next and back, which is an interesting phenomenon. Activity at Fissure 6, morning of May 25, 2018. Lava fountains built a small spatter cone (black mound) from which lava is spilling out and flowing into a small pond left of the cone. Kealiʻikanakaʻole: There’s a knowing that the movement we’re seeing today on the surface is already happening underneath. Kealiʻikanakaʻole says you might not notice, but earth tremors before an eruption send millipedes, centipedes and red worms to the surface. Kealiʻikanakaʻole: When the Pele starts to activate, all the crawly things start to come out of their homes. Kealiʻikanakaʻole: Olaʻi time is the time of shaking. During ola’I time, there’s a quickening of the cells. We’re talking about it now, but it’s continually happening. There’s small olaʻi, there’s big olaʻi, and there’s very deep olaʻi, and there’s travelling olaʻi. You know in the same way we can hear the thunder rolling toward us, we can actually hear the earthquake rolling towards us. Over Kilauea's East Rift Zone, Fissure 22 is off to the right, producing a lava channel that is flowing downhill toward the left. Kealiʻikanakaʻole: Right before that’s going to happen, you feel a quickening in the body and it’s really cool. I don’t know if this is TMI or anything but, that quickening of course starts from the bottom from the poli of the wawai and just comes up the feet and then it hits your own procreative center and you go, Whoa! And then it works itself up in a wonderful spiraling of events. Just the magnet of the energetics of what’s happening under the earth really pulls the body fluids and the body structure in different directions. The Pele is responsible for the magnetic force of the earth. 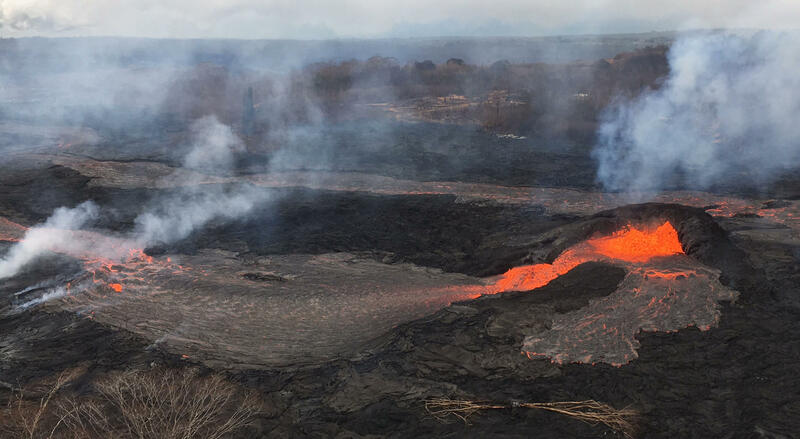 Kealiʻikanakaʻole says with care, this eruption should cause no loss of life. The surface lava is exciting and inspiring, but the long-term relationship with Pele elements is, ultimately, a relationship with forces deep in the earth. 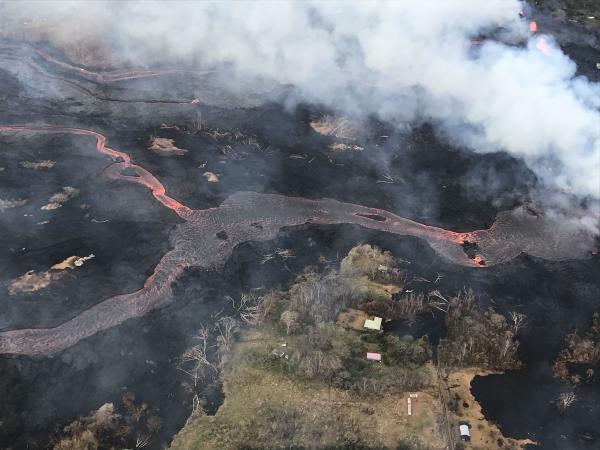 Lava from Fissure 6, building a berm across Pohoiki Road. Kealiʻikanakaʻole: The island is pumping. It’s moving, it has been, for the last millennium. Even though it’s exciting and inspiring to see what it looks like on the surface, I think the long term relationship with the Tutu Pele element and all of her relatives is an outcome of my expectation of what’s already happening underneath the surface. 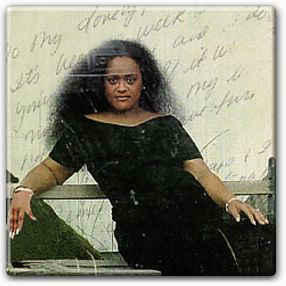 Kumu Hula Kekuhi Kealiʻikanakaʻole won a Na Hoku Hanohano award, the Hawaiian Grammy equivalent, as 1998 Female Vocalist of the Year for her album, Kekuhi. Spirited, tender, swinging, bold, it's a bracing, and completely satisfying example of Hawaiʻi island mojo.